Update: Star Fox Zero has finally received an official release date. Nintendo says we can expect to be saving Corneria in time for the holiday season. Star Fox Zero will drop on Nov. 20 in the US and Europe. Fox McCloud and the gang are finally making their return to the Wii U with Star Fox Zero this holiday. Star Fox Zero was announced at E3 2014, but was only in the developmental stage and couldn't be showcased. This year, Nintendo opened its digital conference with an extended look at the gameplay of Star Fox Zero and a look at what went into the game with designer Shigeru Miyamoto. The new space adventure feels like the good old days of Star Fox, with a lot of added functionality. The Wii U Gamepad is being utilized like it was always meant to be, doubling as a virtual cockpit, giving players added control over the third-person world. On the new functionality, Miyamoto said, "You can be really immersed in the experience." 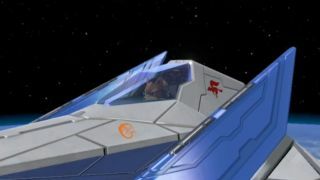 Star Fox Zero will bring many new vehicles beyond the Arwing, including the mech walker from the ill-fated Star Fox 2 for Super Nintendo, something the developers were excited to bring back. This installment will be our first original Star Fox game since 2006's Star Fox Command for Nintendo DS, and will be available this holiday. We'll keep you updated as soon as we learn more about our next Star Fox adventure. Here's the first look at Star Fox Zero's gameplay.